The Duke Company is proud to carry SpecChem products including Pave Cure Rez White. Pave Cure Rez White is a High solids resin based curing compound. PAVECURE REZ WHITE is a high solids water-based, resin-based white pigmented concrete curing compound. When properly applied, PAVECURE REZ WHITE forms a continuous membrane that controls curing for strong and durable concrete. The white pigment reflects the sun’s rays to help keep the concrete surface cooler and to prevent excessive heat build-up. Architectural Coatings Rule. 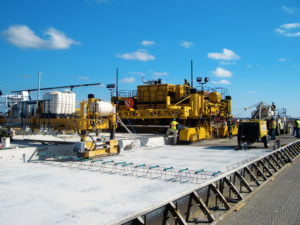 PAVECURE REZ WHITE is ideal for application on exterior, horizontal surfaces such as highways, airports, street and curb paving applications when proper curing is required. Coverage: Ready to use. Do not dilute. Apply with a manual sprayer, power sprayer or paving train. Avoid puddles. Apply in accordance with recommended coverage rates. New Concrete: PAVECURE REZ WHITE should be applied as soon as the surface water has disappeared and the concrete surface will not be marred by the walking applicator. At this point, apply in a uniform coat.